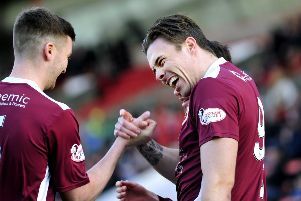 New Stenhousemuir boss Colin McMenamin has had worse weeks. A memorable cup win over local rivals Falkirk and a first job as a manager. Not bad. The 37-year-old was confirmed as Brown Ferguson’s successor on Tuesday, initially until the end of the season, and now can’t wait to get started for ‘real’ after his period in interim charge. It does, however, probably mean the end of an 18-year senior playing career with spells at a host of clubs from Newcastle United to Ross County. McMenamin will still be registered as a player in case of injury emergencies - but his focus is now very much on his role as a manager. He told HeraldSport: “I’m looking forward to getting started and kicking on - it’s been a long three weeks but I can now start preparing for things the way I want to do it. “I’ll be registered as a player simply because I can’t afford the luxury of being another player down. But I’ve probably played my last game. McMenamin admitted that becoming a manager is something he has only considered in earnest since Ferguson’s departure. He said: “You always have in the back of your mind that you want to go into coaching, you want to go down that route. When I came to Stenhousemuir I sat my B License and I’ve done various bits of coaching while being there. McMenamin hopes to have an assistant in place for the Brechin match a week on Saturday. And as a team-mate he won’t have to spend time getting to know the players, although he admits that can be a double-edged sword. He said: “It can work as an advantage because I know the players inside out, but it can also work as a disadvantage in that the players can be too familiar . “I need them to know that just because I was a player with them six weeks ago, it doesn’t make a difference. I want to get a fresh start for everybody and it’s an experience for us all. “I’m going to demand off them and I’m going to expect nothing but 100 per cent from them. I’m not going to be a fool, I’m not going to sit back and be too familiar with them, I’m going to distance myself from now and be as much the gaffer as I can be. McMenamin’s brief over the next few months is a simple one. To climb from the bottom of the table and secure League Two safety. It all starts on Saturday when the Warriors head to Arbroath hoping to end the current league leaders’ unbeaten record.